For those emailing and asking about the Top 100 Starting Pitchers, I appreciate your continued patience as I am diligently working on that piece. 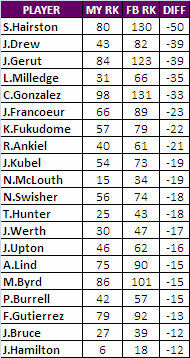 In the meantime, I’m putting together another comparison of outfielder lists. Today I picked up the Fanball.com magazine due in large part to the fact that it prominently features a very good friend of mine, Jason Collette. The presentation of the magazine is absolutely wonderful, second to none. I’ve only just begun to read the magazine so I don’t have any specific thoughts on the feature articles or rankings just yet. I’ll post the comparison on Tuesday and should be able to include a triple comparison of my list and the two magazine plus how outfielders are being taken in mock drafts being held at MockDraftCentral.com. All the thoughts and theories of the lists are nice enough, but how is it all playing out when teams are being assembled? I hope to finish a couple of other things for the fantasy guide this week, so please stay tuned for those updates as well. I made a trip to the local Barnes & Noble today in search of fantasy baseball magazines. Specifically I was looking for the FanBall offering as a good friend of mine, Jason Collette, is a big part of their coverage. Unfortunately, it was not in but I did pick up the annual Sporting News fantasy baseball magazine. Say what you will about fantasy baseball magazines and their value, but I usually end up with three or four every year and I make no apologies for it. Having just finished my outfielder rankings, I immediately turned to SN’s rankings of outfielders to see how the two lists compared. What follows is a comparison of the two lists. There were 96 of my outfielders in their top 105 so that’s what I’ll be looking at here. It was interesting to see who I really liked compared to them and who they really liked compared to me. There were 14 players that SN & I were within one rank +/- of each other. Coco Crisp was the biggest split between the two sets of rankings. Initially, I thought that might just be because they went to press before Crisp was in Kansas City. One of the biggest knocks on magazines is timeliness. At any rate, they DID have Crisp in KC… they just didn’t see him as being all that valuable. We differed on a lot of young guys: Milledge, Dukes, Jones, Maybin, Upton, Bruce and Young all got much lower marks from Sporting News. I don’t necessarily consider myself the type of fantasy player that buys into youth and potential all that much. I like proven, established players much more, but it would appear that Sporting News has me beat on downgrading youth movements. His minor league performance was not indicative of the player Holliday became with Colorado, but he is moving to one of the best pitchers’ parks in the American League. It would be foolish to expect 30 home runs or .319 average in Oakland, but the Athletics value stolen-base efficiency, and Holliday was decent on the basepaths last season. I love Holliday and I really hope he gets those kind of numbers, but the two entities seemed to contradict one another. At any rate, I am by no means trying to start crap with Sporting News and say I’m right and they’re wrong. I think the comparison between rankings is half the fun of coming up with a rankings set. I want to again thank everyone for their very kind words about the piece. I put a lot of effort into doing the work and I really hope you all find some value in it for your fantasy prep this winter/spring. Please continue to stay tuned to the blog for more rankings, articles and discussion.